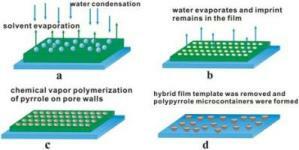 In this article, a facile template synthesis of polypyrrole (PPy) microcontainers based on honeycomb polystyrene/FeCl3 (PS/FeCl3) hybrid films was reported. The templatimg hybrid films were prepared with static breath-figure (BF) technique. PPy microcontainers were formed by the selective oxidative polymerization of pyrrole on the hybrid film cavities, which were decorated with interfacial aggregation of FeCl3 for Pickering emulsion effect during the BF process. Synthesize of other materials, e.g. polyaniline, polythiophene, with similar microstructures by the technique is currently under investigation.